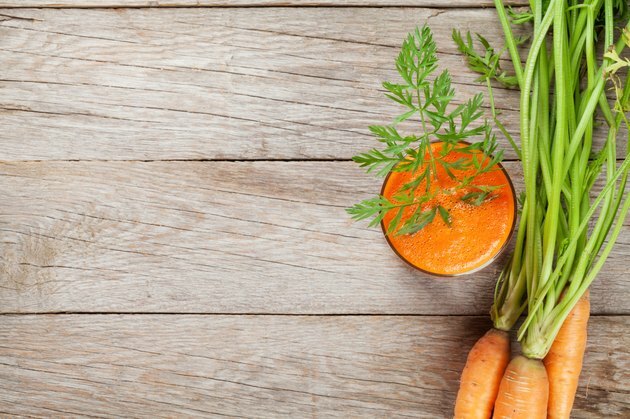 An important source of vitamin A, the carrot is a favorite ingredient for juicing enthusiasts. Your local food store may stock carrot juice near tomato juice and vegetable juice blends. While carrot juice doesn't contain the fiber of whole carrots, it does offer vitamin A and other benefits, including sweetness and color. But while drinking it is the obvious primary use, you may find yourself wondering what you can do with excess amounts of carrot juice. Use a carrot juice blend as the cooking medium for grains instead of plain water or chicken broth. To prepare rice, Utah State University's Cooperative Extension program suggests simmering 1 cup of uncooked rice in 1 ½ cups of water, ½ cup of carrot juice and seasonings. The cooking time will be determined by the exact grain of rice you are using. Add carrot juice to other grains which absorb liquid as they cook, such as quinoa, barley or couscous. When steaming or poaching fish and chicken breasts, add carrot juice to the water or stock to infuse the white meat with flavor and nutrients. Just as grated carrot pops up in sweet foods like tea breads, ginger bread, muffins and cake, carrot juice adds nutrients and moistness to baked goods. Experiment with traditional recipes by replacing some or all of the liquids with carrot juice. Replace some of the cream or stock in creamed vegetable soups with carrot juice. The juice is an obvious enhancer of "cream of" carrot or tomato soup, but also adds depth to thick pureed soups based on root vegetables, such as turnip, parsnip or rutabaga. In broth-based soups like minestrone that normally call for tomato juice or crushed tomatoes, add carrot juice instead. If you have just a few ounces of carrot juice, blend it into traditional tomato-based pasta and pizza sauces. Or use a larger amount for all of the liquid in a creamy, low-fat topping for pasta, seafood or vegetables by blending cooked carrots with carrot juice and low-sodium broth. Add brown sugar or seasonings to reduce bitterness or blandness. Carrot juice also blends well with orange juice and ginger in Asian-style marinades and stir-fry sauces. Add fat-free color and tang to salad dressings with carrot juice. Use three parts carrot juice to one part lemon juice or vinegar. Season with fresh or dried herbs, spices, salt and pepper and even dehydrated vegetable bits, if desired. Whisk all of the ingredients in a bowl or shake them in a clean glass jar before gently tossing them with a green salad. Add depth to sweet or savory juices and smoothies by adding leftover carrot juice. Carrots and oranges are a classic pairing, while tomato juice becomes vegetable juice with the addition of liquid carrots. If you own a juicer, chances are you'll create a myriad of combinations using juices not normally found in supermarkets, such as kale or celery. Carrot juice adds its own vitamin blend, as well as color and a hint of sweetness to other liquefied veggies.